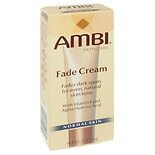 Shop Ambi Fade Cream (2 oz. )2 oz. $679$6 and 79 cents$3.40 / oz. 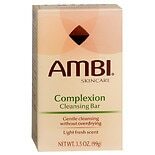 Shop Ambi Complexion Cleansing Bar Soap (3.5 oz. )3.5 oz. $249$2 and 49 cents$0.71 / oz. Dark skin has its own unique set of concerns that people with other types of complexions do not experience. African-American men and women can develop dark spots due to sun exposure and acne and are prone to breakouts and irregularities in pigmentation on the face that can greatly detract from a person's appearance. Many people with dark complexions struggle to find products that are capable of addressing their concerns, which is why the AMBI skin care collection was created. AMBI is a brand devoted to meeting the needs of African-American complexions. The skin care collection includes products that are formulated with therapeutic ingredients to help those with dark complexions have clear, healthy, radiant skin that is more even in tone and soft and silky to the touch. The AMBI skin care collection is produced by Valeant Pharmaceuticals, a company with more than 40 years of experience formulating both skin care products and medications. The company uses strict quality controls and has a top team of researchers working hard to develop every formula, ensuring that AMBI products are pure, effective and produced using the latest in skin care science and technology. Walgreens carries all of the most popular AMBI skincare products at prices that are low, every day. By shopping the skin care collection, you can put together a complete regimen to fully meet the needs of your complexion. AMBI offers specially formulated cleansers to purify the skin and get a daily care routine off to the perfect start. Cleansing products are available in different formulas with something for every skin type, so that all African-American men and women can find an ideal solution for their skin's unique qualities. 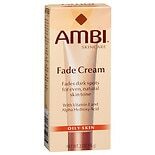 In addition to cleansers, AMBI offers a range of facial fade creams that can help minimize the appearance of dark spots to make areas that are discolored due to the sun or acne far less noticeable on the skin. Completing the regimen are lotions and moisturizers that keep dark skin nourished and in good health and help to fight symptoms of dehydration. Explore the AMBI skin care collection at Walgreens and develop your own personalized regimen to help you achieve your beauty goals.